What surfaces does it handle? Does it come with added tools? ​How much suction power does it have? Does it take care of pet dander (efficiently)? Dragging out an upright vacuum can be a huge pain when all you want to do is clean up a little pet mess. When pet owners think about the mess they deal with, the number one culprit is the hair their pets constantly leave behind. A lot of time, you’re either getting out the cleaning stockade, or trying not to pull out their own hair in the process. That’s why it’s so critical for people with shedding pets to get a cordless vacuum made to help with the pet pick up jobs. Let's get started! The Tineco A10 Hero lives up to its name with suction 4 times more powerful than most cordless vacuums, and even better: it’s really lightweight in spite of its high power. This handy 2 in 1 cordless vacuum from Puppyoo gives pet owners plenty of reach, while its washable HEPA filter and 4 stage filtration system make sure that even the tiniest or particles get picked up and stay out of your carpets. The Shark Ninja IonFlex 2x DuoClean uses innovative MultiFlex technology, which allows you to reach areas a traditional vacuum cant. It has powerful suction for how versatile it is. This Moosoo cordless pet hair vacuum takes care of your home and your floors. It has an incredibly powerful brushless motor, making it great for hardwood floors. While it can handle low pile carpets and rugs, where it really takes the cake is on hard flooring. The brush roll is designed in 2 stages to pick up all sizes of particles while being gentle on your floor and leaving it looking smooth and clear. Powerful suction with optional max power mode, for ground in pet messes. Includes LED power brush, 2 in 1 dusting brush, mini power brush, crevice tool, and storehouse with battery charging port. User needs to remember to disengage battery charging when power light blinks full to prevent overheating. The Tineco A10 Hero lives up to its name with suction 4 times more powerful than most cordless vacuums, and even better: it’s really lightweight in spite of its high power. Really, it’s designed for the pet owner that wants awesome function, and a little bit of everything else. It’s designed differently than many other cordless pet hair vacuums. It can be extended from the handle to function as a hybrid between a strictly handheld vacuum and an upright vacuum. Why bust your back when you don’t have to, right? The filtration also caters to pet owners with its 4 stage filtration system that helps capture and seal in allergens and microscopic particles. The Tineco Hero can handle any surface, low or high, and it can reach just about any area. With the super maneuverable design, you can get the pet hair that holds up under low furniture, and clean the cobwebs in the ceiling corners when you’re done. So not only does it give a lot of cleaning power, but it also has a longer run time than many cordless vacuums: at least 35 minutes running normally and an impressive 22 minutes on its high power mode. When you choose to stand it upright, the wide rectangle brush lets you cover more area at once, without missing out on getting corners clean. When used in the handheld, more compact mode, you have 3 different brush attachments included to make sure you’re getting the most effective use of your pet vacuum. If you hate running out of charge mid clean you’ll really love this bonus feature: the battery light indicator lets you know how much more cleaning you can pack in. Includes 2 ION rechargeable battery packs, so you can clean longer and never worry about going to use your vacuum only to find a dead battery. The SharkNinja IONFlex 2X DuoClean answers the complaints that often followed cordless vacuums in the past. What’s more: it answers them and then provides quite a bit extra. First, let’s talk about the innovative MultiFlex technology. It goes beyond typical vacuum flexibility, allowing you to bend the wand to reach every place pet hair hides in. You can flex it, use it as an upright, or use it as a handheld vacuum, guaranteeing you get the dander up wherever it drifts. It contains a dual battery system. That means that you can clean longer than with just about any other cordless vacuum on the market. Using both batteries you get a total of up to 80 minutes cleaning time, no interruption. This Moosoo cordless pet hair vacuum takes care of your home and your floors. With an uber-powerful, brushless motor, you’ll know you’re getting rid of the pet mess without leaving scuff marks behind on hard floors. Yes, that means it’s both safe and effective for all surface types, including wood (to learn more about cordless vacuums for wood, click here). The advanced triple filtration system gets all the messy little particles that lurk wherever your pets go, plus it leaves the air clearer and cleaner. Between the swivel design and LED front lighting, there's no way you'll leave a patch of pet hair behind. If you like taking care of your pets and the environment, the washable HEPA filter will count as a big win in your book. Eureka is already known for their high-quality vacuums, but this PowerPlush model takes pet hair clean up to a new standard. While it can handle low pile carpets and rugs, where it really takes the cake is on hard flooring. The brush roll is designed in 2 stages to pick up all sizes of particles while being gentle on your floor and leaving it looking smooth and clear. Much like our other featured models, you can separate the handle and handheld portion for more mobility and reach as you clean. The washable filter removes allergens that leave guests watery eyed while ultra-efficient cleaning power takes care of all the mess you can (and can’t) see. It’s light enough to take anywhere in the home whether you use the handle or not, and after a long day, that’s a big bonus feature. To make sure you’re getting the right cordless pet hair vacuum, you can weigh some factors to find a model that gives you everything you need. Some cordless vacuums do have interchangeable brushes, but they still may not be designed to perform on certain surfaces. For example, the cordless vacuum your best friend loves for their lab’s shedding on their hardwoods may not handle your cat’s shed on heavy pile carpet. Keep in mind cordless vacuums aren’t really meant for a whole house cleaning, so you need to consider the areas you’ll be using it in. If you have a big problem with stair crevices and furniture or curtains gathering pet hair, make sure your cordless vacuum accommodates that. No matter how great the vacuum performs, it can be a deal breaker if its battery barely holds a charge, or takes unusually long to charge. With improving technology, cordless vacuums now hold charges longer and charge more quickly than before. But that doesn’t mean the playing field is even. Some vacuums can clean for nearly an hour, while other can get about 20 minutes. Make sure it can handle how long you in between cleans go for and then make sure the charge will be finished by the next time you’d regularly use it. It isn’t a necessity for pet hair vacuums to come with extra tools. In fact, there are vacuums that function efficiently enough with accessories added, but it is nice to have a hidden tool or two to make tough areas easier. Many pet hair vacuums include special tools that cater to pet owners trying to keep up with shed. Often, you’ll see a crevice tool, upholstery brush, pet hair tool, or something similar. Don’t discount a cordless pet vac just because it doesn’t have extras, but if you’ve got tough cracks and corners that pet hair sticks to, see if there’s an optional add-on tool. Heavier pet hair messes will need a vacuum that can handle heavier suction needs. 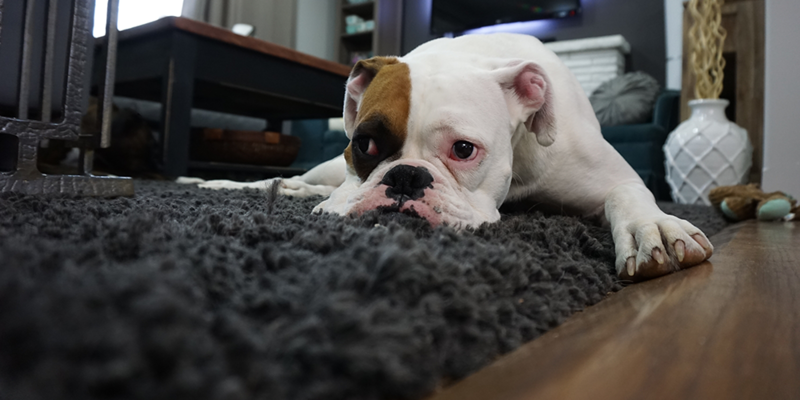 If you have medium to heavy pile carpet, thick rugs or the like, you’ll need a pet hair vacuum that has a stronger motor and suction system. Likewise, low surfaces may not need as much suction power, and you can splurge on other extra features instead. Aside from pet hair, one of the biggest reasons to get a pet hair vacuum is to take care of pet dander. These particles are much harder to pick up and contain, and as a result, they’re an irritant that tends to stick around even after you clean. That’s why, it’s important to look for a vacuum with a HEPA filter and/or specialized allergen and particle containment system, especially if you have loved ones with allergies. Cordless vacuums are always lighter than upright vacuums, and many models are lighter and more maneuverable than corded vacuums. Cordless pet hair vacuums are easily portable, meaning you can take them in the car after your pet’s had a ride along with you. Most cordless vacuums are made for easy, compact storage that simultaneously charges them while they’re being stored. They can be used to reach more difficult places that cords can’t reach. Some models have more limited cleaning time, whereas with a corded model you don’t have a battery run out. When the battery dies, if you forget to charge it, you won’t be able to use it immediately. Depending on the model, the weight can be higher than with corded models due to the extra components. Having a simple solution that allows you to get rid of pet hair without doing a full out clean is a time, stress, and sanity saver. Cordless vacuums are especially helpful for pet owners because they allow reach into areas that pet hair tends to gather (which tend to be the difficult spots). Cordless models allow for easy stair cleaning and are easily accessed and used when you need a quick fix. Without being tethered by a cord, these pet hair vacuums allow for efficient cleaning both inside the house and out. Don't like any of these? Well, we have more! If you want to see this years picks for the best vacuums. period. Check out Modern Living 101's top choices.